Flow cytometric analysis of live human peripheral blood mononuclear cells using NCAM1 (CD56) (MY31) Mouse mAb (PE-Cy7® Conjugate) and co-stained with CD161/KLRB1 (HP-3G10) Mouse mAb (violetFluor™ 450 Conjugate) #26540 (right), compared to concentration matched Mouse (MOPC-21) mAb IgG1 Isotype Control (PE-Cy7® Conjugate) #79339 (left). NCAM1 (CD56) (MY31) Mouse mAb (PE-Cy7® Conjugate) recognizes endogenous levels of total NCAM1 (CD56) protein. This antibody detects an epitope within the extracellular domain. 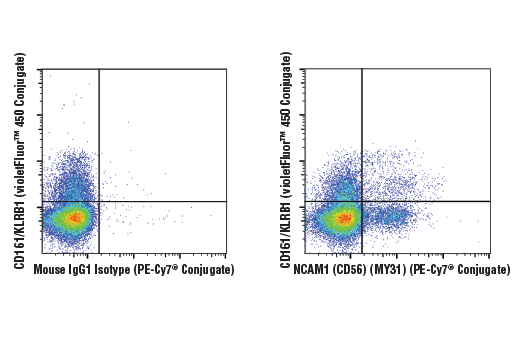 This Cell Signaling Technology antibody is conjugated to PE-Cy7® and tested in-house for direct flow cytometric analysis in human cells.